Bruttium League. AE Sextans. ca. 215 to 205 BC. Date : ca. 214 to 211 BC. Size : 16.8 x 17.4 mm Weight : 16.73 grams. Grade : gVF/Vf with a dark brown glossy patination. Well-centred with full inscriptions. 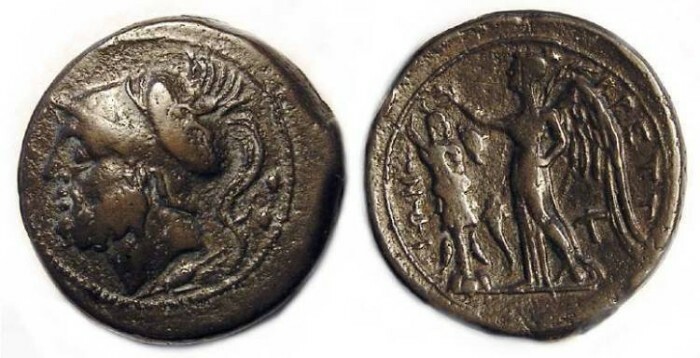 Obverse : Helmeted head of Ares left, with two pellets as the denomination mark to the right. Reverse : Nike holding a palm branch, and crowning a troply on her left, with a small cornucopiae between, and BRETTIWN around.